I’m a Pinterest junkie. When I first discovered Pinterest, we had recently moved into a house that we were renting. This house was (and is) literally twice the size of our previous teeny-tiny home. And I am a decorator. When we got settled I realized that there was a lot to be done to make the new house feel like “my” space. Enter Pinterest. I found loads of great decorating and design ideas on Pinterest, and for two years I faithfully filled up my boards. Some of the projects I pinned I was able to do, but most of them I was not, since we were renting and I couldn’t do anything permanent to the house. Our house was built in the late 80s. Which is good on a lot of fronts – it’s relatively newer, it’s spacious, it has a very family-friendly layout. But the bad news about that time period is that honey oak must have been ridiculously popular – it’s everywhere. We have oak floors (good), oak-y colored doors (okay), oak-colored trim (bad), oak cabinets (bad), there is even oak trim around the countertops (bad bad bad). Oakey oakey oak oak oak. Oy! I have noticed that when I find design and decor I love, there is usually a high amount of contrast going on. Needless to say, with oak upon oak upon oak, my home had very little contrast. I knew with the cabinets I either wanted to go very dark or very light (well, actually I did both). 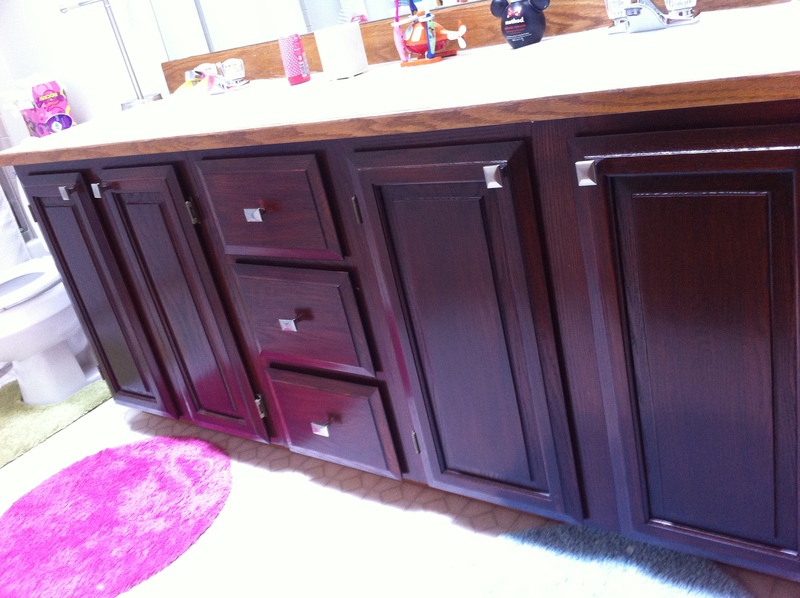 On Pinterest I had seen a lot of projects where handy people used General Finishes Gel Stain to darken up their honey oak cabinets. I thought it looked great and couldn’t wait to try it. And then with a stroke of luck we were able to buy our rented home! Yippee! The good news: I could finally do all of things I wanted to do to the house, since it was ours. The bad news: well, you know the term house poor? Yeah, that. Limited budget. But guess what? Gel stain is cheap. So, that was the first project I took on when the ink was dry on our contract. I started in the kids’ bathroom. I figured if I really screwed it up they would forgive me. =) For the most part I used this tutorial from the Monica Wants It blog. I bought small pint size jars of the gel stain in two different colors from Rockler woodworking. One was Java (which is the most popular color on Pinterest), and the other was Brown Mahogany. I did a couple samples and went with the Brown Mahogany. It was deep and rich like the Java, but had some nice reddish undertones and also didn’t veer too far into the black category. As I went along, I did a few things differently than the tutorial, and got good results. The first change I made was that I labeled all of the hinges as I was taking them off, and used painters tape to both write the label on (1upper, 1lower, 2upper, 2lower, etc.) and to tape the screws to their corresponding hinges in the exact place they were before (top or bottom, you get what I’m saying here). Yes, this is a little OCD, but I did it because in my old house, I painted my kitchen cabinets and I did NOT label the hinges. 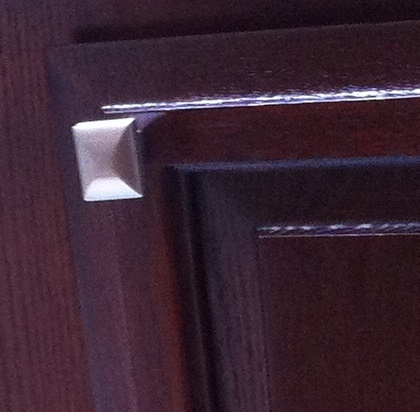 When I put the doors back on the cabinets I could not get them to hang perfectly straight. SO frustrating! So, by being OCD in the beginning of your project you can avoid this same fate. The second (and most important) change I made was in the prep work. I wound up buying a small sander (the Mouse) from Home Depot – it was around $30. This let me do a better job on the sanding step and made the process much faster. See, with the gel stain, if you have any grease spots at all on your cabinets, the stain won’t take there, and you’ll have a weird looking lighter spot. My cabinets were so old that even after I cleaned them thoroughly I still had a few of these phantom grease spots. The hand held sander took care of that. The thrid change I made was when I stained the door fronts. See these little inset areas? I just wasn’t able to get the stain into the tiny little nooks and crannies with a tube sock. So I took a small, cheap artist’s brush, and I brushed the stain in those insets first; then I followed up with the tube sock. 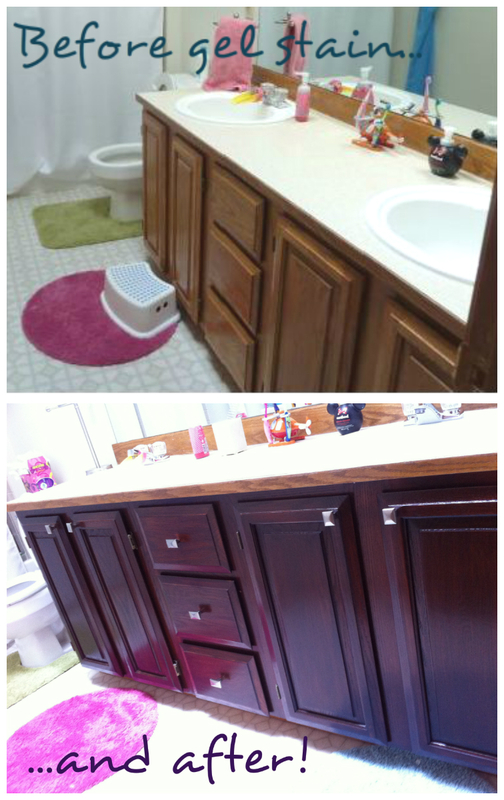 Here is the “before” of the kids bathroom vanity. And here’s the after! Oooh, so shiny. The pictures really don’t do it justice, and friends that come over have a hard time believing that they are even the same cabinets (I also added knobs). The gel stain is wonderful – not only does it completely change the color, it tones down the wood grain pattern, and it’s thick and fills in the dinged up areas. It’s like a suit of armor for these old cabinets. I’ve been living with them now for over six months, and the finish is also really durable. 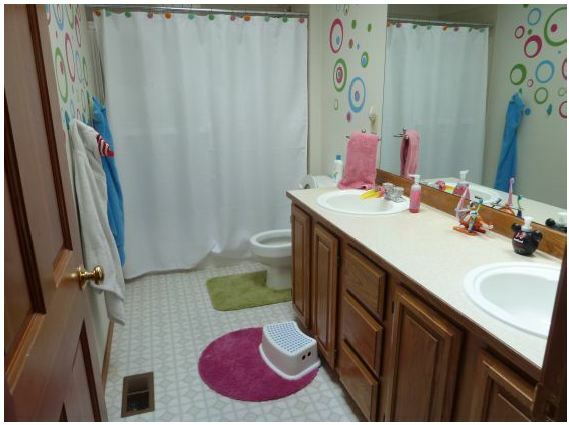 My kids’ bathroom vanity really takes a beating and they always clean up beautifully. Let each coat dry for 24 hours. This is on the directions but they really mean it. I tried to short change it one time by like 6 hours and my finish got all icky. You’ll probably need 3 coats of stain and one coat of top coat. I tried to get away with 2 coats, but the finish is a little streaky when it goes on, so it really take 3 coats to work out the streaks. I would also recommend breaking up a large area (like your kitchen) into smaller sections, so you don’t get overwhelmed. That’s what I did with my kitchen, and I was still able to use my kitchen as I did this project, and it also only took me about an hour each night (sometimes less) to apply the stain. Manageable. Buy your tube socks from the dollar store. I found a pack of three boy’s tube socks that worked great. Don’t buy the cheapest disposable gloves you can find – go one step up. Sometimes the cheap ones would leak on me and I’d have stained fingernails. Tags: cabinet, DIY, gel stain, General Finishes, General Finishes gel stain, honey oak cabinets, oak cabinets. Bookmark the permalink.